A few days ago we celebrated the forty-fifth anniversary of Apollo 11’s historic moon landing, an event that captured the imagination of the entire world and heralded the arrival of a Space Age that, regrettably, has yet to fully materialize. We haven’t been back to the moon since 1972, and our collective dream of becoming a spacefaring civilization living amongst the heavens has gone essentially unrealized—bogged down firmly by the mud of warfare, urgent domestic issues, shuttle disasters, and budgetary neglect. The dream of space is a dream delayed, a fact that was made painfully apparent at the dawning of the twenty first century. The year 2001 came and went, but we were nowhere near living on giant, spinning space stations and flying on commercialized commuter spaceships, let alone undertaking missions to Jupiter and beyond. All of these things were promised to us in a film released the year before we stepped foot on the moon for real and discovered that it was, in fact, not made of cheese. 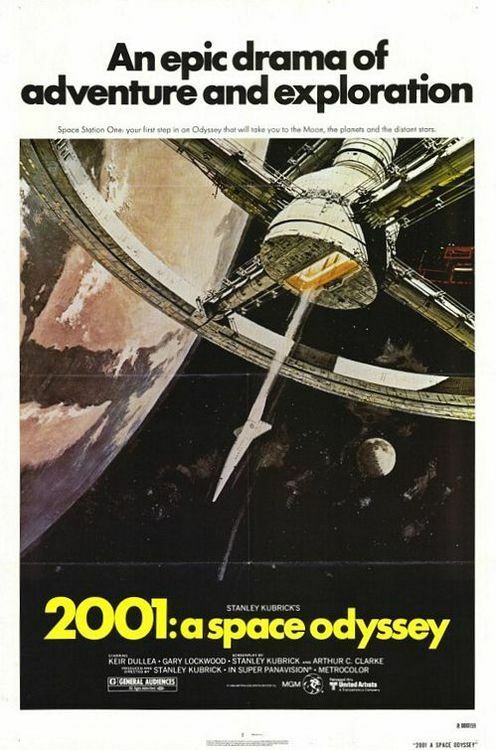 That film was director Stanley Kubrick’s 2001: A SPACE ODYSSEY (1968), and its matter-of-fact, realistic (yet no less romantic) depiction of our spacefaring future captivated the imagination of millions. It became one of the most influential films of all time, and even today it remains a benchmark of craft and design. It is a cultural touchstone, its enigmatic storyline and mysteries sparking an endless debate about our place among the cosmos in addition to smaller (but no less important) matters like the development of artificial intelligence. Kubrick himself was fascinated by these ideas as well as the possibility of intelligent extraterrestrial life, and began a series of discussions with noted science fiction author Arthur C. Clarke in the mid-1960’s. Their conversations gave way to serious collaboration, with Clarke offering up several of his novels and short stories as source material for Kubrick to adapt. Kubrick aspired to make, in his words, the “proverbial good science fiction film”, and fashioned his narrative from a combination of Clarke’s short stories, arranging them into an examination of mankind’s evolution as a process aided by extraterrestrial intelligence. In making 2001: A SPACE ODYSSEY, Kubrick acted as his own producer, and thus had no one that would object to his dropping of traditional story structures and dialogue conventions while rendering the film instead as an enigmatic audiovisual experience. The financial and critical success of Kubrick’s previous film, DR. STRANGELOVE: OR HOW I LEARNED TO STOP WORRYING AND LOVE THE BOMB (1964), gave the visionary director a significant amount of momentum and leeway in getting his follow-up off the ground, and by the following year he was in back in England (where he had since relocated with his family full-time), rolling camera on the film that would cement his legacy as one of the greatest filmmakers of all time. 2001: A SPACE ODYSSEY unfolds against the sprawling expanse of space, but at its core, tells a very concentrated story about mankind’s evolution and taking our rightful place amongst other intelligent civilizations in the stars. Kubrick begins his examination with The Dawn Of Man— the point in which humanity branched off from the line of apes to become the dominant species on earth. Their evolution is kickstarted by the discovery of a massive black obelisk, which bestows superior intellect upon them. Their rapid development is charted quickly and wordlessly— it’s not long until they are walking on their hind legs, and the first use of tools allows the apes to transcend their scavenging ways while empowering them with the means to create their own meals. When a rival group of apes tries to push in on their territory, the newly-evolved apes turn their tools into weapons, and ensure their dominance through violence and murder. Kubrick then cuts to the year 2001, where space travel is commonplace and a similar black obelisk has been found buried underneath the moon’s surface. After laying inert for millions of years, it emits a single piercing radio wave out towards Jupiter before falling silent once again. Excited by the first indisputable evidence of intelligent life outside the Earth, a research mission is organized and sent to Jupiter to see what might be waiting for us there. Dr. Dave Bowman (Keir Dullea) heads the five-man mission, assisted by his deputy Dr. Frank Poole (Gary Lockwood) while the remaining three men hibernate in cryosleep. The ship is guided by a state-of-the-art, artificially intelligent computer named HAL 9000. HAL 9000 is essentially self-aware, and is treated like a sixth member of the crew by the humans until the possibility of a flaw in its computations is suspected. The HAL 9000 series of computers were supposed to be perfect and utterly incapable of error, so the Jupiter mission’s HAL was given complete control of every single system on the ship. Naturally, even the smallest of computational errors on HAL’s part could mean that the entire mission might be compromised. When Bowman and Poole attempt to re-assert manual control of the ship and shut HAL down, the self-aware computer uses the ship itself as a weapon against the humans in a defensive bid to keep itself operational. What neither Bowman or the all-knowing HAL 9000 can predict is that they are on a crash course with the next stage of human evolution, a stage that lies outside the space-time continuum and within a different dimension entirely. Kubrick’s films have always been noted more for their craft and style than their cast, and 2001: A SPACE ODYSSEY reinforces that notion almost to an extreme, scaling back the characterization to the barest of minimums. Dialogue is almost nonexistent, with the first spoken line not occurring until we’re already twenty-five minutes in. What little dialogue there is serves either as exposition or as a means to move the story along in the simplest of strokes—anything else is banal and ordinary, emphasizing Kubrick’s thesis that space travel would be so commonplace by the year 2001 that any novelties would have worn off. This idea is personified in the character of Dr. Heywood Floyd (William Sylvester), who is introduced to us early in the film as a travelling businessman en route to the moon, his lack of wonder at the whole enterprise suggesting he’s made this trip several times before. He’s more attached to his life back home on earth, at one point even making a video call to his daughter on her birthday (played by Kubrick’s own daughter, Vivian). Keir Dullea plays the Jupiter mission commander Dr. Dave Bowman, who can be considered the film’s conventional protagonist. However, his personality is downplayed considerably, achieving a blank, emotionless slate that tells us absolutely nothing about who he is as a person. The same can be said for the Gary Lockwood’s slightly more-aggressive deputy, Dr. Frank Poole. Since this is a Kubrick film, we should know by know that his story choices will always skew towards what’s most poetically ironic. In that respect, 2001: A SPACE ODYSSEY is a stroke of genius in its depiction of the self-aware, artificially intelligent supercomputer HAL 9000. Voiced by Douglas Rain and represented only by a red light inside of a large glass lens, HAL 9000 is perhaps the most emotional, relatable character in the entire film, a strange claim considering that as a computer it can’t physically emote. HAL 9000’s omniscience gives way to something resembling neuroses, and its ability to acknowledge its own existence leads to it actively protecting said existence at any cost. One would be hard pressed to find a villain in cinematic history that’s more fundamentally chilling and iconic than HAL 9000. The sequence where HAL 9000 begs in its characteristic monotone for Dr. Bowman to not disconnect it is especially haunting, simply because its lack of a physical body renders it ultimately unable to defend itself against Dr. Bowman’s particularly monstrous determination. The visual style of 2001: A SPACE ODYSSEY marks a radical shift in Kubrick’s aesthetic, not the least notable aspect of which is the director’s return to glorious color after 1960’s SPARTACUS. Shot by cinematographer Geoffrey Unsworth in the staggeringly wide 2.20:1 Super Panavision aspect ratio, 2001: A SPACE ODYSSEY is a film that demands to be seen on the largest screen possible. My first experience with the film was on a regular consumer television, but shortly after I moved to Los Angeles, I caught a screening of a 70mm film print at the American Cinematheque’s Egyptian Theatre and the experience was nothing less than a revelation. Kubrick’s panoramic vistas are rendered in large swaths of vibrant, searing color (or, alternatively, inky blotches of black). He makes excellent use of the color red in particular, using it as a recurring visual motif to distinguish man from the colorless voids of space and technology. Red, as we all know, is the color of blood—the essence of life, so to speak. In the film, it is a color that belongs firmly in the domain of the humans—it is the color of Bowman’s spacesuit, for instance, as well as the interior of the reconnaissance pods—the only part of the ship safe from the watchful eyes and ears of HAL 9000. However, as HAL 9000 becomes more human-like in its expression of concern, the balance of red’s ownership tilts decidedly in the computer’s favor. It starts off with only the little red right in its “eye”, but much like the inside of the human body, Kubrick eventually reveals that HAL 9000’s interior memory mainframe is literally drenched in red. Kubrick’s camerawork in 2001: A SPACE ODYSSEY echoes HAL 9000’s supposed infallibility in its compositional precision, deliberately set back from its subjects so that it may observe the action in a cold, clinical manner devoid of subjectivity. Kubrick’s frame makes excellent use of depth, frequently incorporating one-point perspective compositions whose lines all converge towards a singular point in the distance. The pacing is glacial—at times unbearably so—but it also reinforces the endlessly patient, calculating nature of its antagonist. Despite the plodding nature of 2001: A SPACE ODYSSEY’s storytelling, Kubrick and editor Ray Lovejoy still infuse it with punches of New Wave expressionism, like jarring jump cuts that radically disrupt the visual continuity. The most famous example of this is perhaps the most famous jump cut of all time, where Kubrick jumps forward four million years within a single frame by cross cutting from a bone in the air to a similarly-shaped satellite suspended in orbit above the Earth. Nearly fifty years after the film’s release, this cut in particular is still breathtaking in its sheer audacity. Kubrick’s inventiveness extends to other aspects of the film, such as sound design. 2001: A SPACE ODYSSEY was groundbreaking in its realistic depiction of the sonic aspects of space travel. Most science fiction films tend to value entertainment over realism, and thus blatantly disregard the well-known fact that space is a vacuum, and sound needs air in order to travel and be heard. Recent films like Alfonso Cuaron’s GRAVITY (2013) have re-introduced us to the idea of the silent cosmos, but Kubrick’s realistic treatment of the phenomena in 2001: A SPACE ODYSSEY blazed the trail in using the lack of sound as an asset. Long stretches of the film are just simply the sounds of the astronauts’ breath inside their own helmets, and they are just as tense and exciting, if not more so, than they would be if accompanied by a richer soundtrack. Kubrick approached the film’s visual effects from a similar standpoint. Whereas CGI-laden films from a few years ago now look dated and fake to our eyes, the effects of 2001: A SPACE ODYSSEY hold up, even looking arguably more realistic than the best that modern CGI can offer. Kubrick was praised throughout his lifetime as not just a gifted storyteller, but also as a pioneer in filmmaking technology. His inherent knowledge of the film medium gave him the confidence to create 2001: A SPACE ODYSSEY’s striking effects in-camera, fully rendered onto the original negative so as to preserve the highest image quality. Despite having a team of visual effects artists at his disposal, it was Kubrick himself who accepted the film’s sole Academy Award win (out of thirteen nominations) for its visual effects. The irony of the only Oscar Kubick ever won being the result of work he couldn’t fully claim as his own surely must not been lost on the master filmmaker. As an artist who demanded complete control over his projects, Kubrick prized shooting his films in the manageable isolation of studio sets. This also allowed Kubrick to impose his own design aesthetic on the sets themselves. 2001: A SPACE ODYSSEY must have been a very appealing project to Kubrick in that the demands of the story dictated shooting entirely on soundstages. After all, it’s not like they could exactly go up into space and shoot “on location”. This, combined with the need to create the various miscellanea of a futuristic existence results in what is perhaps one of the most meticulously designed films ever made. I’m not exaggerating—Kubrick even placed detailed instructions on how to use the space station’s toilet on the front of the bathroom door even though it served absolutely no story purpose. Ernest Archer, Harry Lange, and Anthony Masters share the Production Designer credit under Kubrick’s vision, creating a distinctly-1960’s vision of the future. Kubrick and his designers incorporate banks of pure white light into their sets as a recurring motif throughout the film, such as the walls of the briefing room on the moon, the floor of Bowman’s baroque-style apartment suite in the “stargate” sequence, and the entire interior of the earth-orbiting space station. This has the effect of creating a cold, even light that eliminates all shadows and allows Kubrick to objectively examine his subjects like they were exhibits in a museum. The technology on display in 2001: A SPACE ODYSSEY is remarkably prescient. While full-scale space travel is not yet a reality, we do have several things (albeit about thirteen years late) that the movie predicted would be commonplace by the dawn of the twenty first century: portable computer tablets (iPads) and video calls (Facetime), for instance. I wouldn’t be surprised to find the research and development facilities at Apple looking like they were straight out of this film. If anything, it just proves how highly influential 2001: A SPACE ODYSSEY continues to be. Of course, any projection as far into the future as 1968-era Kubrick made is bound to have missed a few marks. Kubrick rather accurately predicted that space travel in the twenty first century would give way to private corporations and commerce rather than remaining strictly government or military endeavors. While this is now in the infancy of becoming a reality thanks to Richard Branson’s Virgin Galactic and SpaceX, Kubrick erroneously (yet logically) predicts that major airlines would have made the natural expansion into space—Dr. Floyd is seen flying to the moon in a Pan-Am branded spacecraft. Since Pan-Am wouldn’t last as an operating company long enough to even see the year 2001, it’s easy to look back on Kubrick’s inclusion and laugh. However, that would be losing sight of 2001: A SPACE ODYSSEY’s design as a valid historical document—an expression of our dreams and hopes for the future during the romantic era of space flight. Given that we have been firmly grounded here on Earth ever since, that aspect becomes more poignant than ever. A dream unrealized. Kubrick’s reputation as a fuser of indelible image and inspired music really begins in earnest with 2001: A SPACE ODYSSEY. Whereas his previous films might have augmented an original score with adaptations of existing classical material, here Kubrick eschews a composer and a conventional score entirely. However, that was not always the intent. Kubrick commissioned an original score from his SPARTACUS composer Alex North, but quickly dumped it when it didn’t meet with his satisfaction. Inspired perhaps by the graceful pirouetting motions of the space station, Kubrick yet again made film history by pairing the sequence introducing mankind’s technological advancements in the year 2001 to the dizzying waltz of Johan Strauss II’s “Blue Danube”. This pairing had such a profound impact on our collective social psyche that I defy you to find someone who doesn’t think of spinning space stations when they hear it. Similarly, Kubrick uses Richard Strauss’ bombastic classical piece “Also sprach Zarathustra” throughout the film to symbolize the wonder of mankind’s evolution. We hear it when the apes realize that bones make great tools, and we hear it again when Bowman re-enters our dimension and is reborn as a star child. Much like “Blue Danube”, this piece is also ingrained into us and paired with visions of space and the cosmos. In addition to using classical music from romantic, Victorian eras, Kubrick turns to compositions from modern maestros like Gyorgy Ligeti, the man behind a fundamentally unnerving suite of cues that accompanies the terrifying appearances of the black obelisk. Primal and dissonant, the piece features a building chorus of men’s voices seemingly scrambling over each other in a bid to escape some unseen evil emanating from the bowels of the earth. It’s the kind of music cue that makes one’s skin crawl, so of course Kubrick uses it as his beginning musical overture, filling the screen with an impenetrable blackness for several minutes before the story begins in earnest. Just as radically as Kubrick deviates from the straightforward visual style of his previous films in 2001: A SPACE ODYSSEY, so too does he loyally adhere to the same set of themes that have fascinated him as an artist. He uses the film’s storyline about evolution as a conduit into further explorations of violence, essentially stating that it is a natural byproduct of the evolutionary process. If evolution can be described as “survival of the fittest”, then it stands to reason that those who can assert dominance over the ecosystem will prosper—and the only way to assert said dominance is by force. The apes’ discovery of tools allowed them to take charge of their own development, but it was only a short matter of time until they perverted the tool’s original purpose for warfare. Mankind built its civilizations on the foundations of violence and war, and as such, it is an inextricable component of our humanity. 2001: A SPACE ODYSSEY filters its ideas about personhood and evolution through the lens of technology, another major theme in Kubrick’s body of work. The character of HAL 9000 represents the countless ethical conundrums surrounding the concept of artificial intelligence, but most importantly raises the question: “at what point does an artificial intelligence achieve personhood?”. The ship’s human inhabitants view HAL 9000 as another crewmate, and they entrust their lives to its stewardship. We know that the computer is as intelligent—if not more so—than humans because Kubrick shows it winning a game of chess against Dr. Bowman (a none-too-subtle nod towards Kubrick’s own dominance at the game). As intelligent as it may be, HAL 9000 is still not a human, and cannot emote—yet it shows increasing signs of paranoia and neuroses as trouble mounts during the mission. It stands to reason that a self-aware entity would fight to defend its own existence, which the story of 2001: A SPACE ODYSSEY makes more than clear when HAL 9000 pleads with Bowman before being shut down. Throughout history, man has fashioned technology in service to its needs, but it’s the tipping point in which technology itself emerges as a dominant species that captivates Kubrick’s interest. Just as we now bear little resemblance to the apes from which we descended, it stands to reason that the next link in the chain of evolution will appear quite dissimilar to humankind. 2001: A SPACE ODYSSEY raises many questions, but it is here that its core line of questioning becomes clear—will humanity’s successor come in the form of cold machines, or does our destiny instead lie out in the vast expanse of the cosmos? 2001: A SPACE ODYSSEY also makes potent use of several of Kubrick’s signature storytelling conceits as a way to imprint his stamp despite the radical tonal departure from his previous work. While Kubrick formally dispenses with the omniscient voiceover narration that peppered throughout his previous films, he essentially achieves the same purpose here with the incorporation of the all-knowing, all-seeing HAL 9000 computer. This is also the film in which Kubrick perfects his use of one-point perspectives compositions, hypnotically luring us deeper into his world by travelling down the length of claustrophobic tunnels. An extreme version of this is evident in the infamous “stargate” sequence in which Bowman travels to another dimension entirely. Additionally, the rendering of Bowman’s enigmatic apartment suite in the gilded style of baroque décor points to Kubrick’s fascination with the era and serves as a link to a common thread that runs through his filmography and its disparate genres and styles. 2001: A SPACE ODYSSEY is no doubt a massively influential work, but it didn’t achieve that status overnight. The film debuted in 1968 to severely mixed critical reception. Kubrick’s intentionally obtuse storytelling frustrated countless old-school critics, but more “enlightened” critics immediately recognized the film’s brilliance and importance. The film also had something of a slow start at the box office until it caught on as a cult hit among young adults, who would come to late-night screenings—stoned out of their gourds no less—to lose themselves in the psychedelic “stargate” sequence. The idea of the film as a cinematic milestone began catching on in earnest when the next generation of filmmakers—the generation that brought us STAR WARS—credited 2001: A SPACE ODYSSEY as a key inspiration in their work. Over time, the film’s legacy has only grown stronger, and its induction into the National Film Registry in 1991 ensured its preservation for generations to come. Perhaps his best known and most widely-viewed film, 2001: A SPACE ODYSSEY rocketed Kubrick to the top of his field, cementing him as one of the most influential filmmakers of all time. Though Kubrick would not live to see the year 2001 himself, his groundbreaking work here assured that his legacy would carry on well into the twenty first century and beyond. 2001: A SPACE ODYSSEY is currently available on high definition Blu Ray via Warner Brothers.